While the workings of the Trinity challenge our understanding, Bible-believing Christians cannot let themselves downplay the Trinity or ignore it. We find the Father, Son, and Holy Spirit each present throughout the pages of Scripture and each equally deserving of our love and reverence. 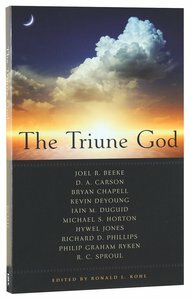 This book dedicates equal space to examining the qualities and roles of each member of the Trinity, as we find them in the Bible, to help us grow in our knowledge and understanding. These leading pastors and preachers will make us more familiar with each person of the Trinity and will show us how to rightly respond to each one. The more we know how to relate to the Trinity, the more we can enrich our love for our triune God. The persons of the Trinity appear throughout Scripture, and knowing them helps enrich our love for our triune God. Here leading pastors and preachers examine each members qualities and roles. Bryan Chapell (Ph.D., Southern Illinois University) is the president of Covenant Theological Seminary and a former pastor who is a widely traveled speaker in the United States and abroad. He is also the author of numerous books, including the Gold Medallion finalist Holiness by Grace, as well as Praying Backwards and the award-winning Christ-Centered Preaching. Most recently he has produced Ephesians (Reformed Expository Commentary). Dr Hywel R. Jones (Ph.D., Greenwich University School of Theology) is Professor of Practical Theology at Westminster Seminary, California. Prior to that he was Editorial Director of the Banner of Truth Trust and Principal of London Theological Seminary from 1985 - 1996. He was a pastor at Grove Chapel, London, and Borras Park in Wrexham. Dr. Jones has written commentaries on Exodus; Philippians, and most recently Let's Study Hebrews and The Book of Job (Evangelical Press Study Commentary). He has also written Gospel and Church; Unity in Truth and Only One Way. Philip G Ryken (D.Phil., Oxford) joined the Staff of Tenth Presbyterian Church(PCA) in Philadelphia in 1995 and presently serves as Senior Minister. He is the author of many books including What Is the Christian Worldview; The Message of Salvation (The Bible Speaks Today Themes;, The Doctrines of Grace: Rediscovering the Evangelical Gospel; Jeremiah, Exodus, and Ecclesiastes (Preaching the Word Series); Luke (2 vols), Galatians and 1 Timothy (Reformed Expository Commentary) and Ryken's Bible Handbook. He also serves on Wheaton College (IL) Board of Trustees, Westminster Theological Seminary (PA) Board of Trustees, and as an Alliance of Confessing Evangelicals council member.